Battling cancer for four years, Maryland mom Darlene Sugg set a goal — she wanted to see her daughter Megan graduate from high school. Last week, as her condition took a dire turn, Sugg got her wish with the help of school administrators who threw together a bedside cap-and-gown ceremony for the teen a month before the official commencement date. There wasn't a dry eye in the room Thursday as Glen Burnie High School Principal Vickie Plitt read a speech she had written just for Megan. Darlene Sugg managed to open her own eyes during the touching address. "She was hanging on to see my proud moment," Megan told NBC News. "She knew it meant a lot." Darlene Sugg, 47, died two days after her daughter received her diploma. Her husband, Steve Sugg, said he knows the ceremony brought her peace in her final hours. "My wife was glowing to see Megan graduate," he said. Darlene, who worked for the National Security Administration, was diagnosed with colorectal cancer in 2010. She went into remission, but then the disease spread. She was transferred into home hospice in April with tumors in her lungs, liver and spine. Her husband, a police detective, said that by last Wednesday, "she was going downhill." "My wife was glowing to see Megan graduate." He decided to take up school guidance counselor Kristin Canevazzi on her offer to organize an early graduation while Darlene was still alert enough to know it was happening. "I know how proud her mom is of her and we really wanted to give her family a special time,” Canevazzi told the Maryland Gazette. The next day, Plitt, Canevazzi and Assistant Principal Clayton Culp showed up in gowns, bearing flowers and the sheepskin. Everyone posed for pictures around Darlene's bed. "Everyone was crying," Steve Sugg said. 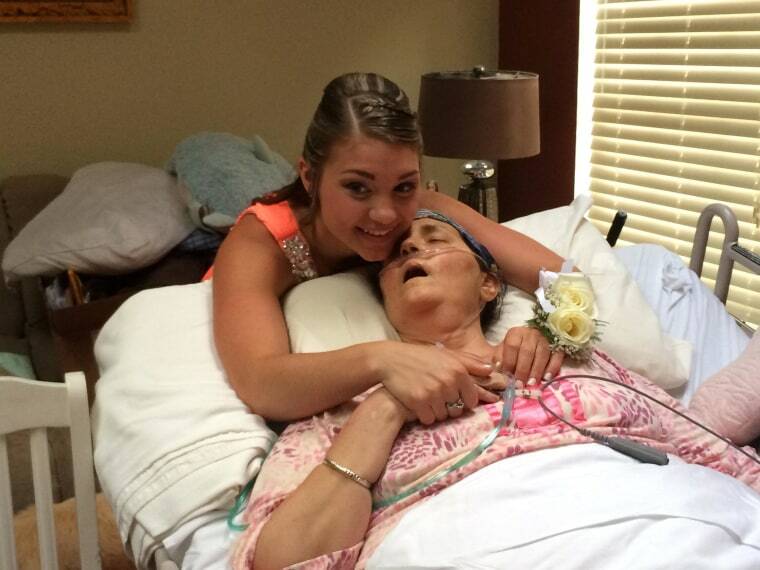 The next day, Darlene Sugg reached another goal, seeing her daughter in her prom dress when Megan put on her gown and went to the senior dance — just as her mom wanted. That night, as she struggled to breathe, her husband told her it was OK to go, he said. But she shook her head and told him in a weak voice that she wanted him to hold her hand all night and that she would be ready in the morning. She took her last breath at 3:25 p.m. on Saturday. "I was still holding her hand," her husband said. As she spoke with NBC on Mother's Day, Megan said she was grateful she got the chance to mark the big milestones while the most important woman in her life was still here. "It was bittersweet," she said. "I was glad mom got to see me graduate, but I was sad to know that was the last moment I'm going to have with her."